These may not be the prettiest looking pancakes but they are oh so good! Thick and flavorful...you definitely need to make these this weekend for brunch! In a large mixing bowl, whisk together the flour, oatmeal, baking power, spices and sugar. Spray the griddle well with Pam, or use a small amount of oil. When the griddle is hot enough, spoon some of the batter onto frying pan and spread it slightly into a circle. Yay for pumpkin...yay for fall! PS...there's still time to enter to win $100 to Minted! I am all about pumpkin stuff right now, so I will def make these and I bet Sterling would love them! Yum! Yes I love all the pumpkin recipes that start coming out about now. Will have to try!! I'm going to have to make these this weekend! yum! 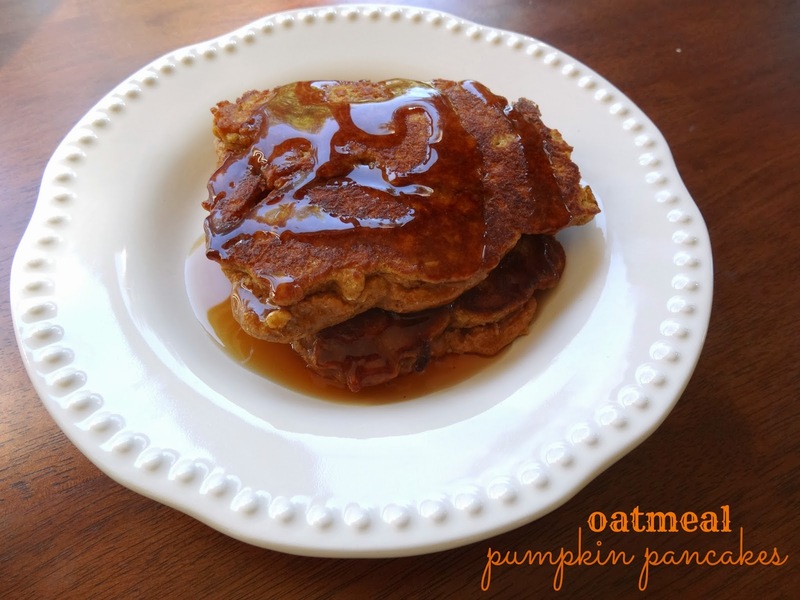 we love pumpkin pancakes, but never made oatmeal... will have to try!! Yum! I'm totally making these this weekend! Oatmeal in pancakes? That sounds amazing! yum! Must make these this weekend maybe before our big trip!! :) FALL obsessed over here. Yum these look SO amazing!!! I wish David liked pancakes!! We never have them in our house. Luckily a baby will remedy that one day! Yum! I'm obsessed with pumpkin! Definitely going to try these, they sound amazing. These look like pure heaven. 100% making these tomorrow or sunday... i have all the ingredients in my pantry. winning! annnd now that you showed off all of your other pumpkin recipes it looks like i should stock up on canned pumpkin. Minted Feature + $100 Giveaway!